The Tree House is a Brown County cottage located in a valley surrounded by tall, white pine trees and features a creek that runs past the house. A large front yard allows for lots of playtime outside with a fenced back yard for your 4-legged family member. The interior of the house features pine floors made of wide beveled planks and exterior wavy siding lends a rustic feel. The main floor features a wood burning fireplace in the living room, a fully equipped kitchen with a table for six, and the master bedroom with queen bed and bathroom. Upstairs there are two cozy bedrooms each with a double bed and a shared bathroom. 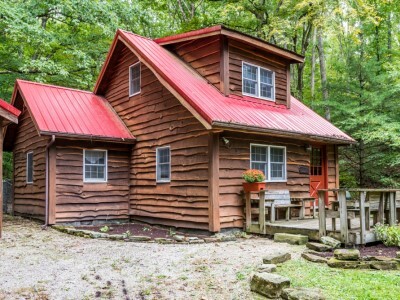 This home is located 3.5 miles from Nashville and 5.5 miles to the Brown County State Park. If you need additional space, guests can stay at the nearby Elm Lodge.